I’m obsessed with “mini” things. Little spoons, tiny dishes, mini pots and pans. 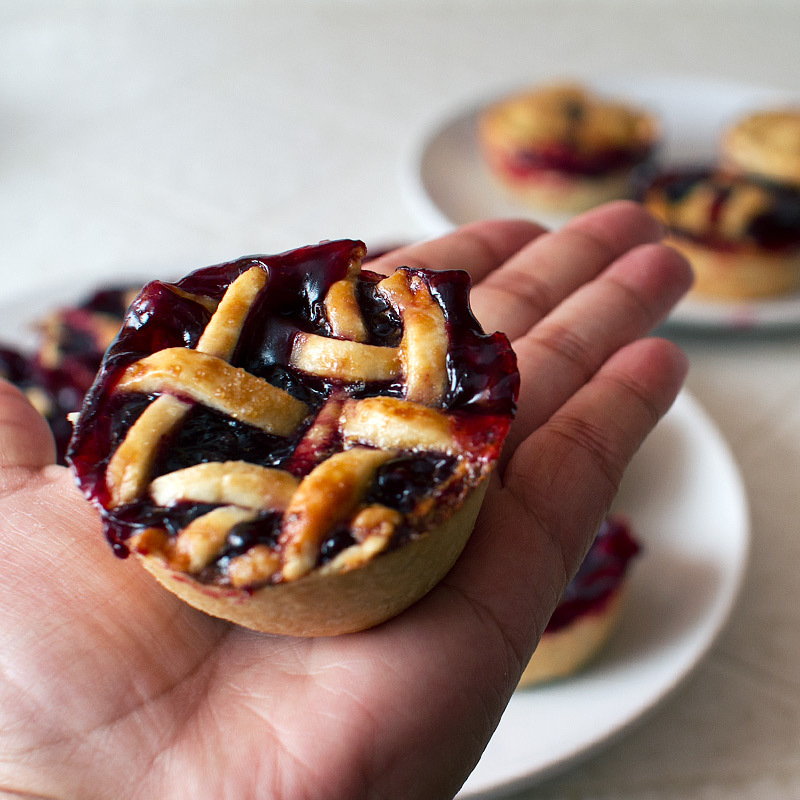 And mini pies. 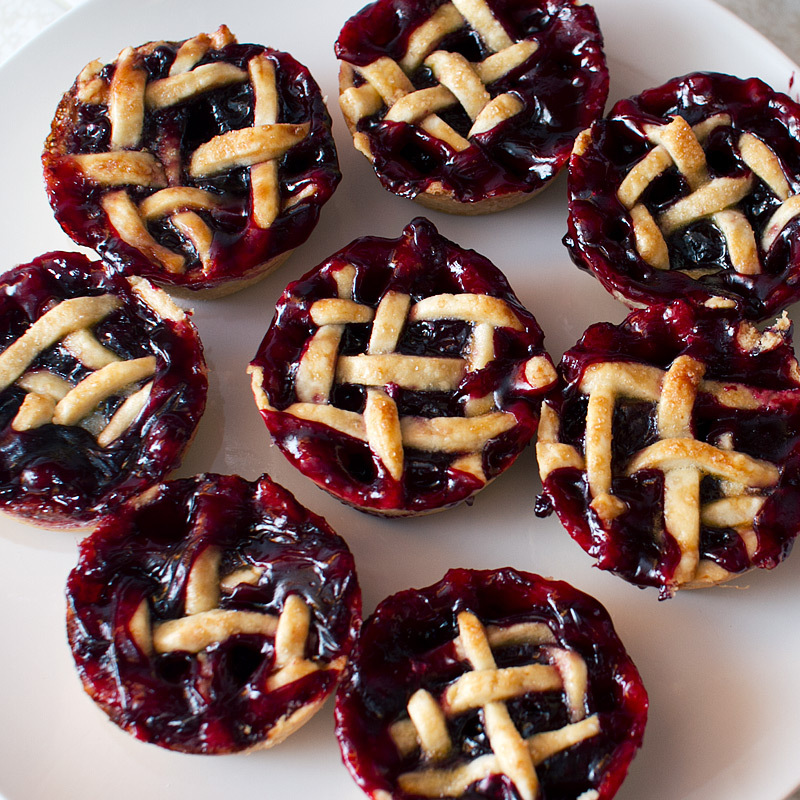 With mini lattice tops. I can’t even. I couldn’t find any sour cherries, but I did find some super sweet dark cherries at the farmers market. I highly recommend investing in a cherry pitter. 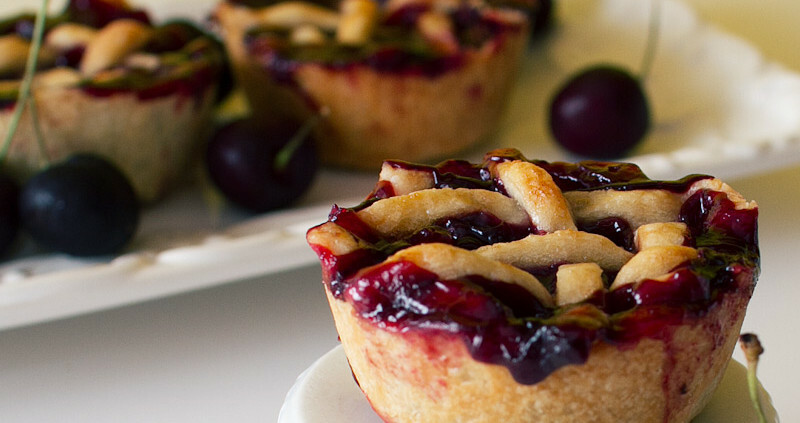 If you’re not a fan of a kitchen tool that only has one purpose, check out these options for pitting cherries without a pitter. 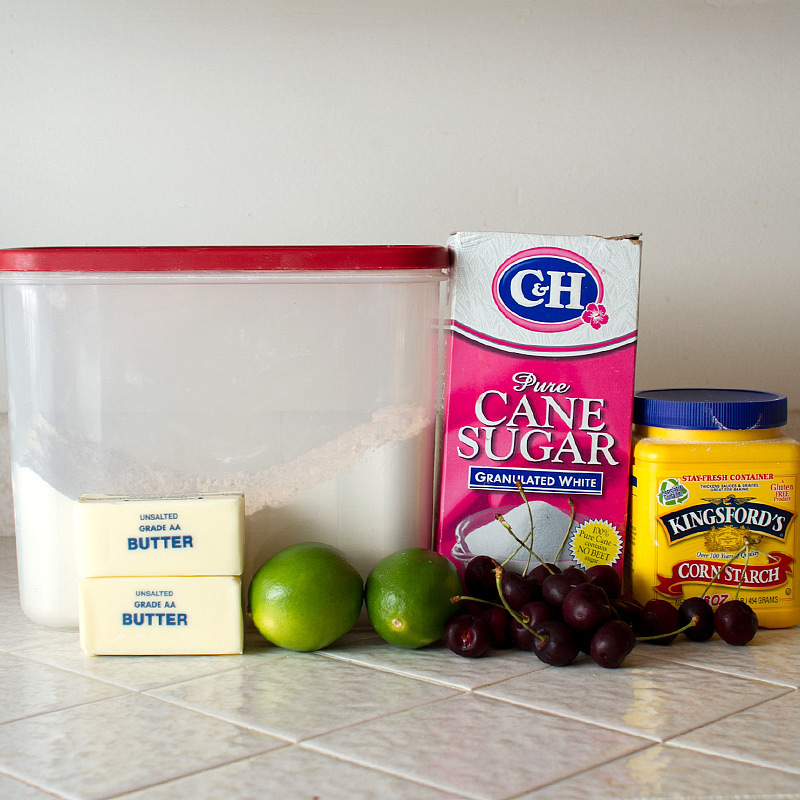 You’ll need flour, sugar, cornstarch, cherries, limes, butter and one egg (not pictured). 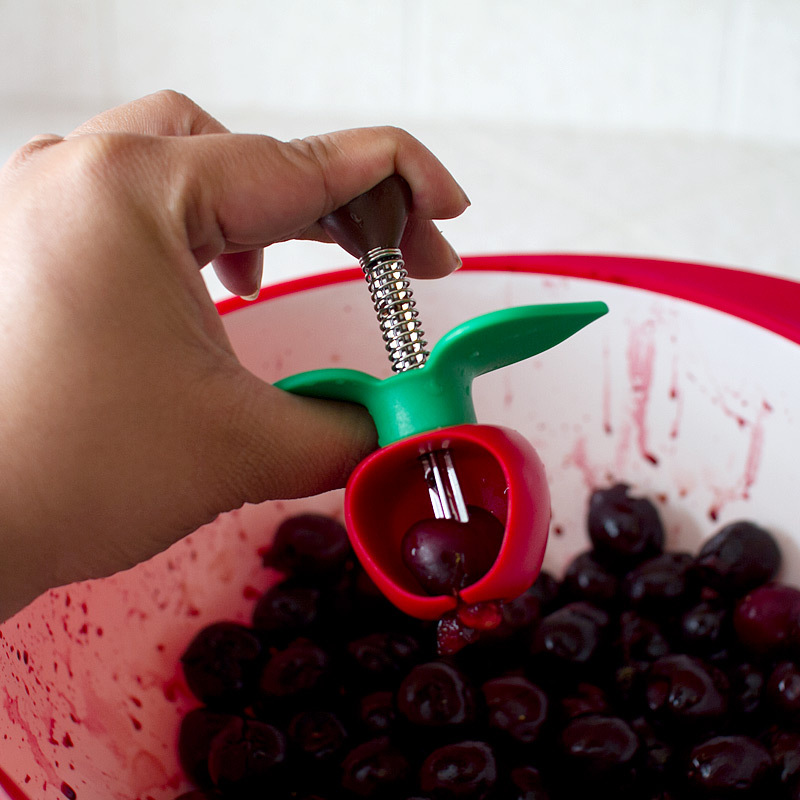 How cute is my cherry pitter!? It only took 1 1/2 episodes of Grey’s Anatomy (thanks, Netflix!) 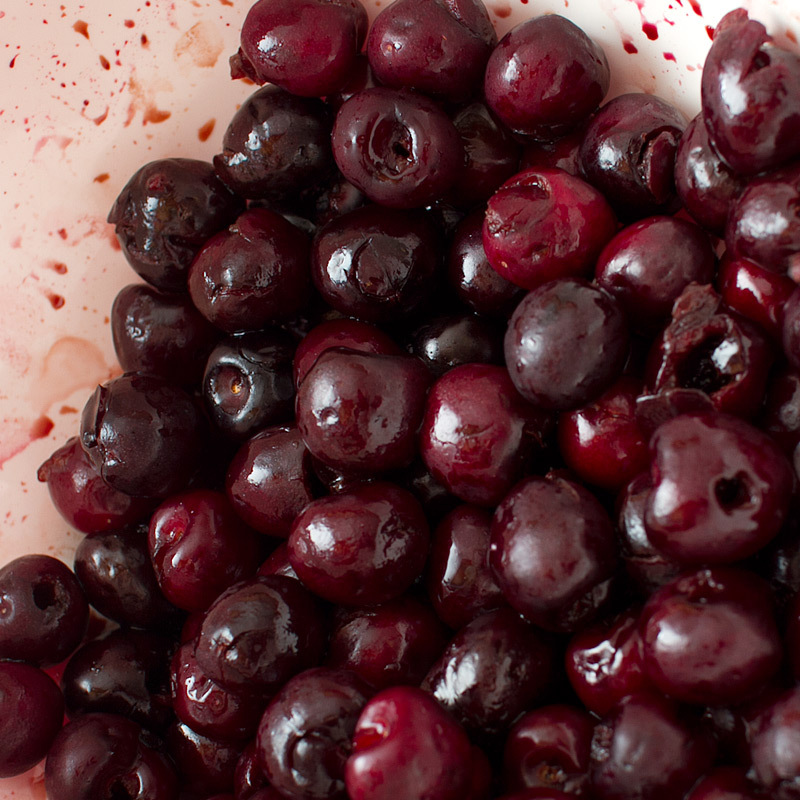 to pit 4 cups of cherries. Here they are, in all their pitted glory. 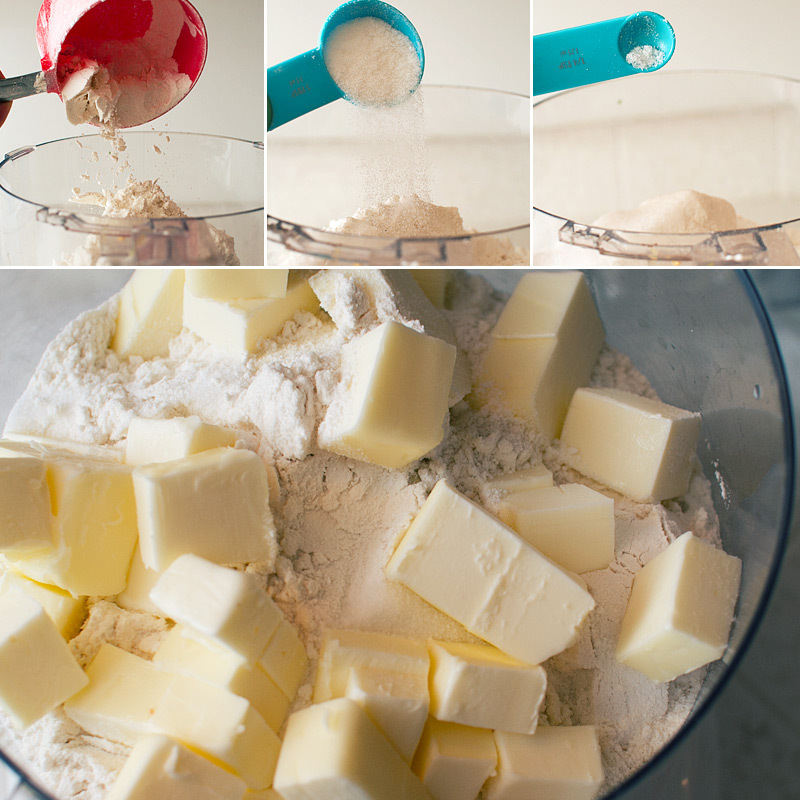 In a food processor, combine the flour, sugar, salt and cubed butter. Pulse until the mixture resembles a coarse meal. Add in ice water and pulse until the dough pulls away from the sides and begins to form a ball, adding more water (1 tbsp at a time) if necessary. 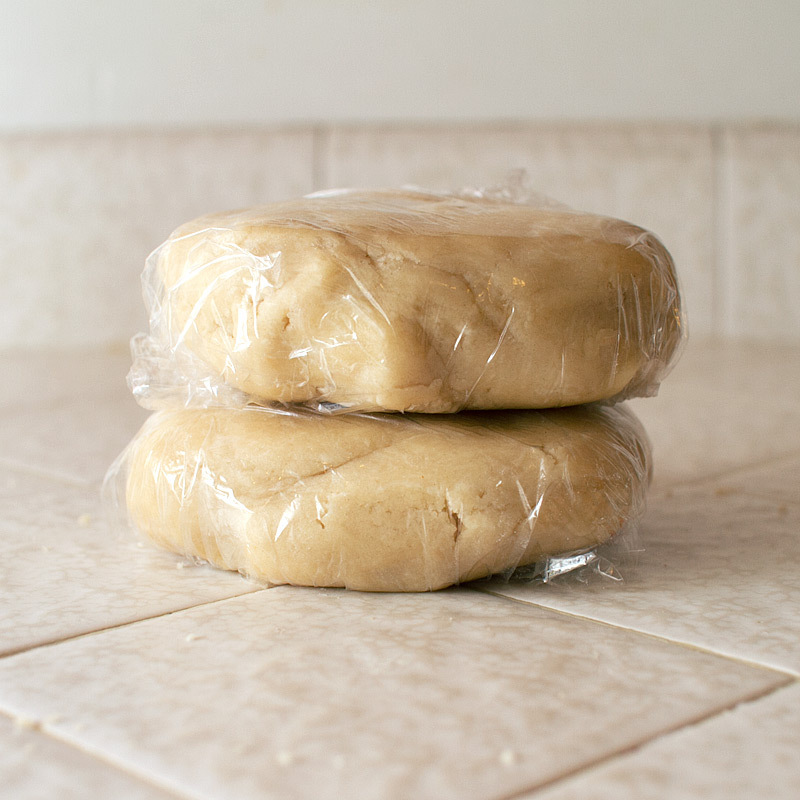 Form the dough into two discs and cover in plastic wrap. Let chill for at least one hour. While the dough is chilling, prep the filling. 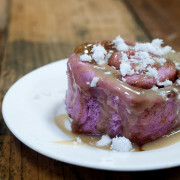 … and the cornstarch and sugar. Bring the mixture to a boil and cook for another minute. 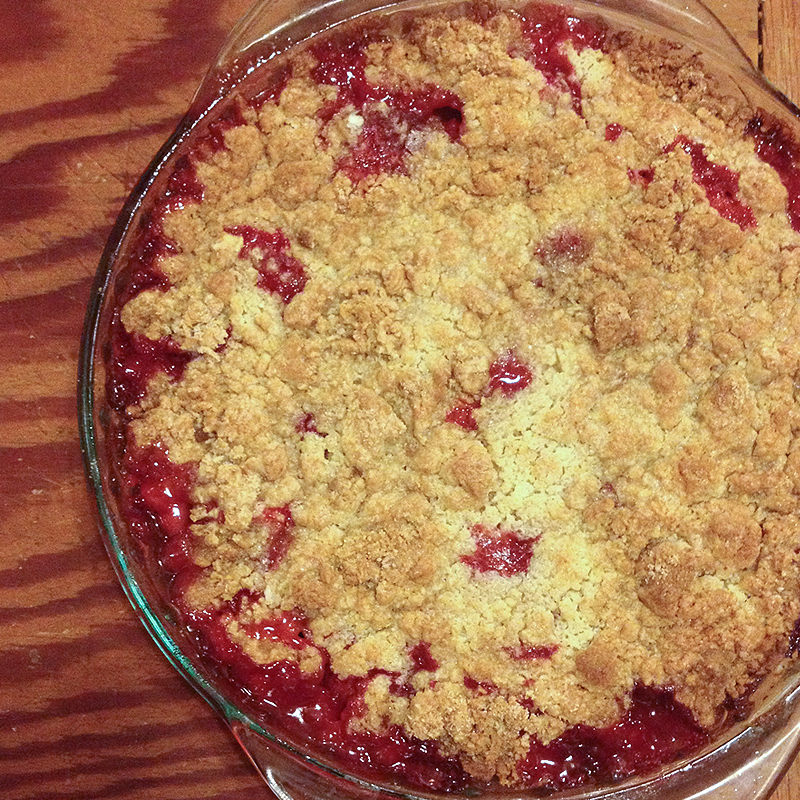 It should be thick and the consistency of…well… cherry pie filling. lol Let the mixture cool. Roll one disc of dough out to about 10″. Cut out 12 rounds, about 3 1/2-4″ wide. Refrigerate the scraps and repeat with the second disc. 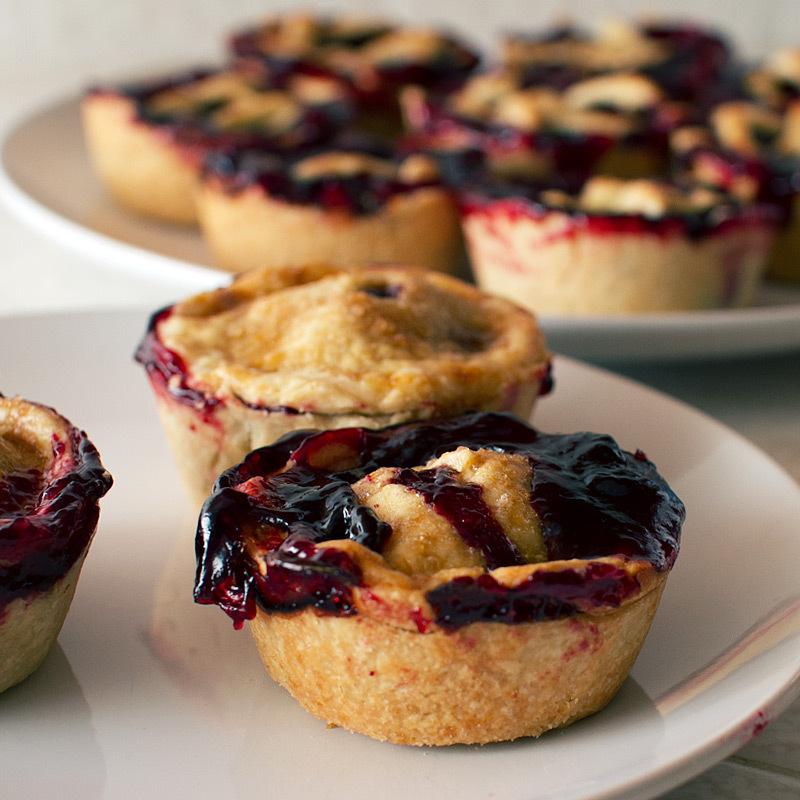 Fit each disc into the cup of a well-greased muffin tin. Refrigerate. 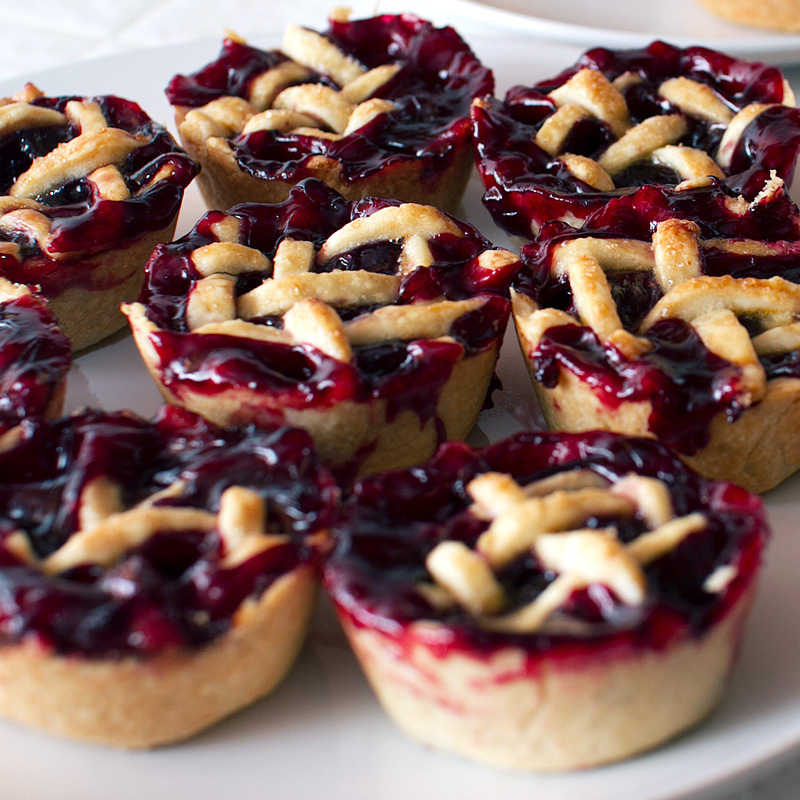 For a top crust, roll out scraps and cut out 3″ rounds. Fill each cup with 1 1/2-2 tbsp of cherry filling, almost to the top. So, this is my first time lattice-topping a pie. 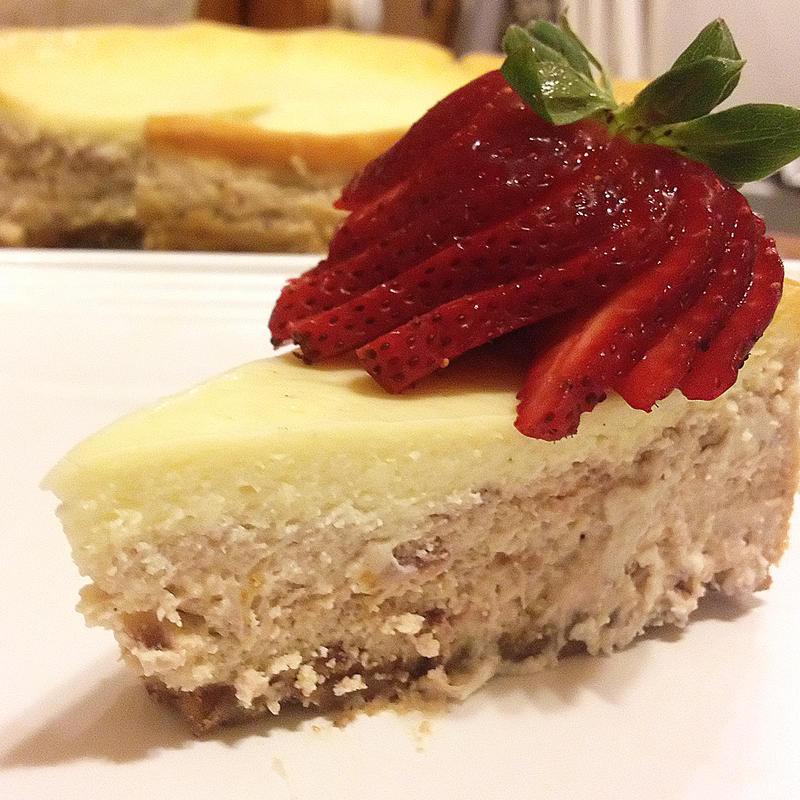 I can’t explain how to do it, so just look at these pictures or click the link to step-by-step instructions in the directions of this recipe. Lay a few down, then lift up and insert other strips, man… I don’t know how to explain this, but you can see what I did right? Right. …and sprinkle with a little coarse sugar. This is optional, but I like the texture it adds to the crust. Pop it into a 375F oven for ~30 minutes. At this point, I realized that I probably over-filled the cups. Oops. But that’s okay, they are still very edible and very delicious! 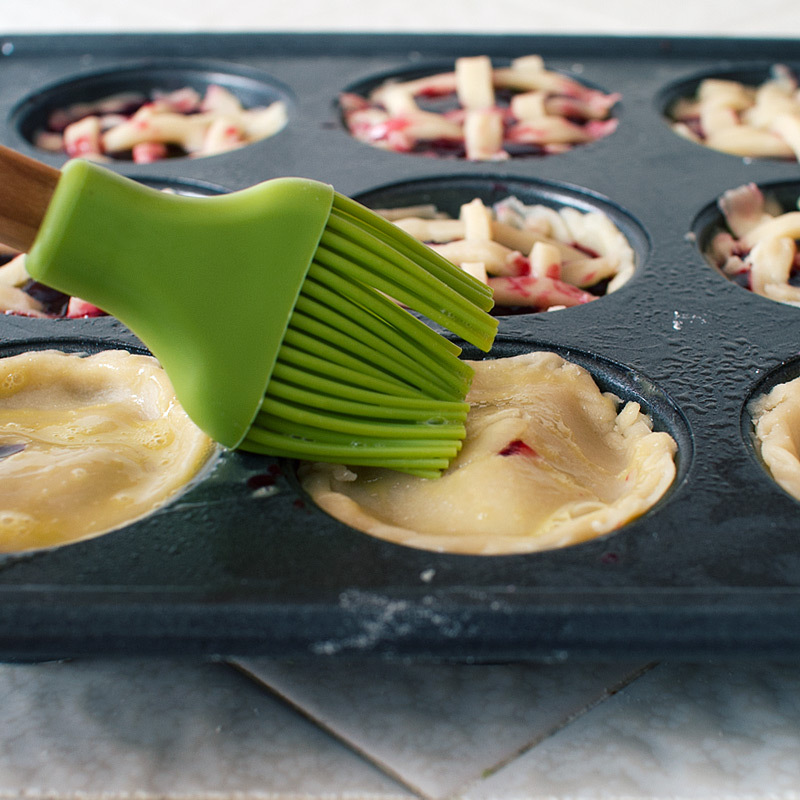 Let cool in the muffin pan for 10 minutes before removing. 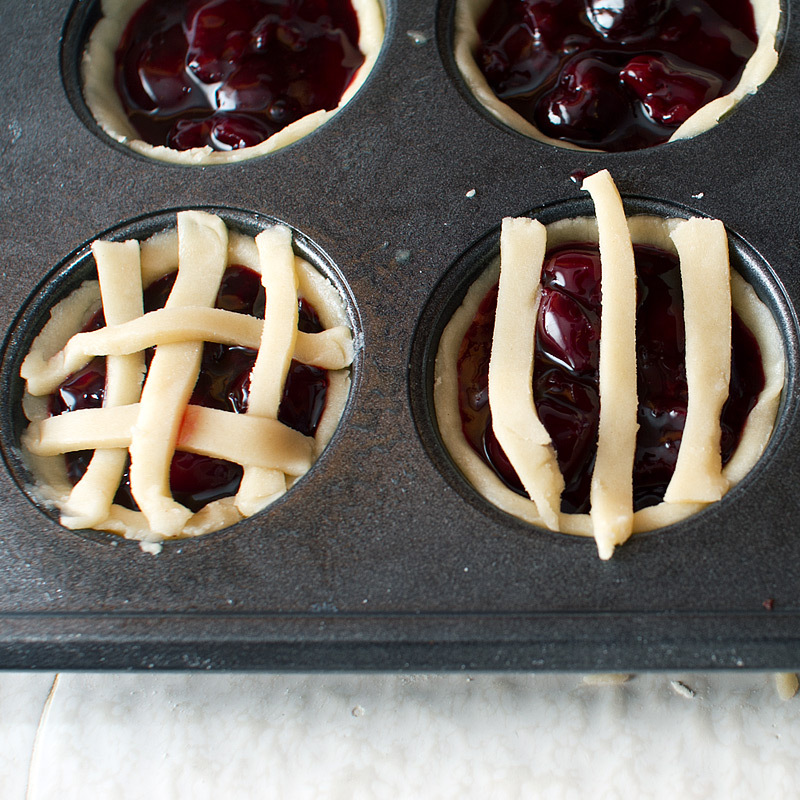 …aaaand our super tedious but totally worth the outcome lattice crust! Just so teeny tiny and adorable!! 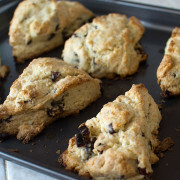 In a food processor, ad dthe flour, sugar, salt and cubed btter. Pulse until the mixture looks like a coarse meal. Add in 4 tbsp of ice water and pulse until the mixture begins to pull away from the sides and forms a ball. If the mixture is still a bit dry, add water, 1 tablespoon at a time, and pulse again. Form the dough into two discs, wrap in plastic wrap and chill for at least an hour. 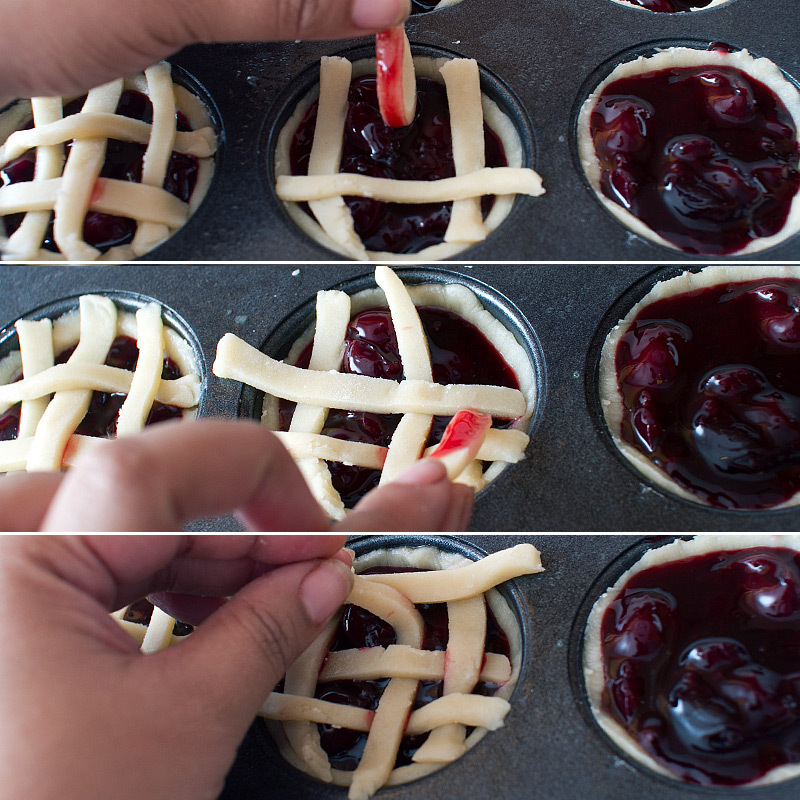 In the mean time, prepare the filling. 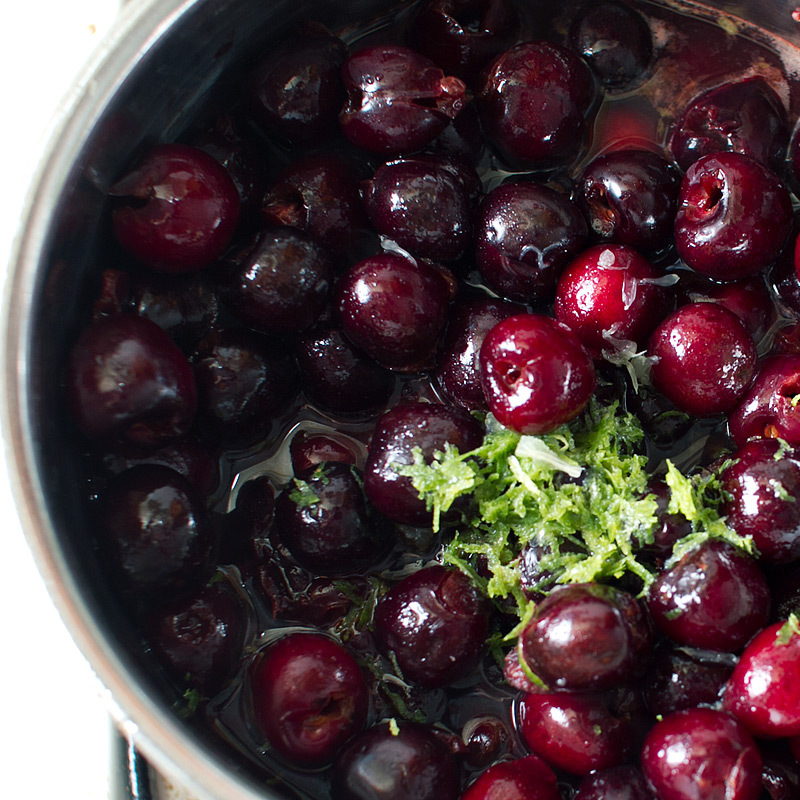 In a medium saucepan, combine cherries and 1 cup of water. Cook over medium heat for 10 minutes. Stir in lime zest and juice. 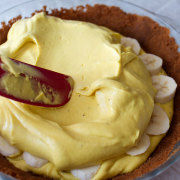 In a small bowl, stir together the sugar and cornstarch until well blended and there are no lumps. 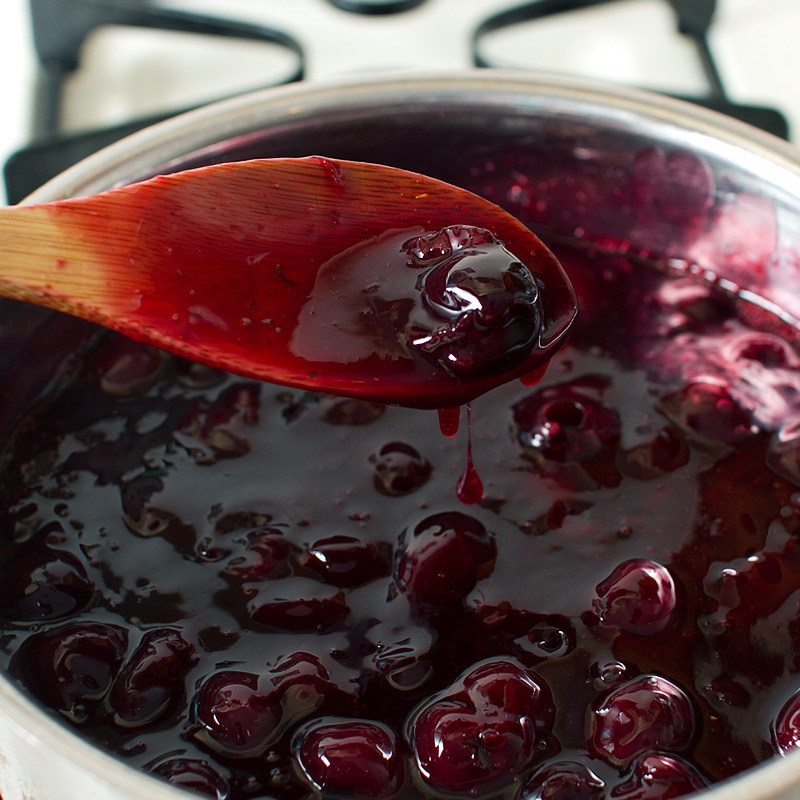 Add mixture to cherries and stir until it comes back to a boil. Boil for another minute, until thickened. Set aside and let cool. 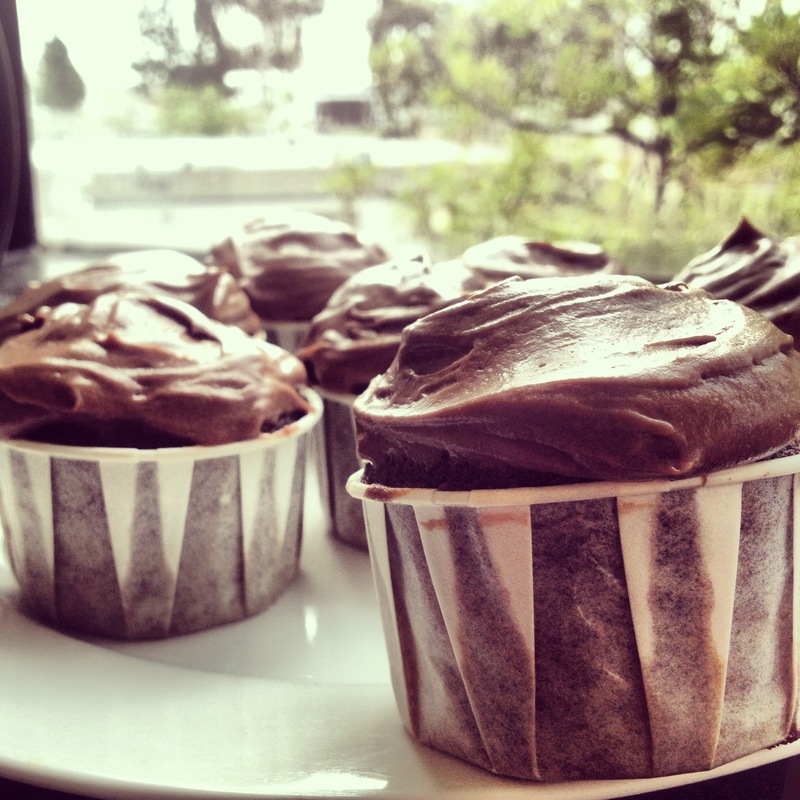 Generously oil the inside cups as well as the top of a 12-cup muffin pan. It’s important to get the top as well – it makes clean up a lot easier. Roll one disc of dough into a ~10″ circle. 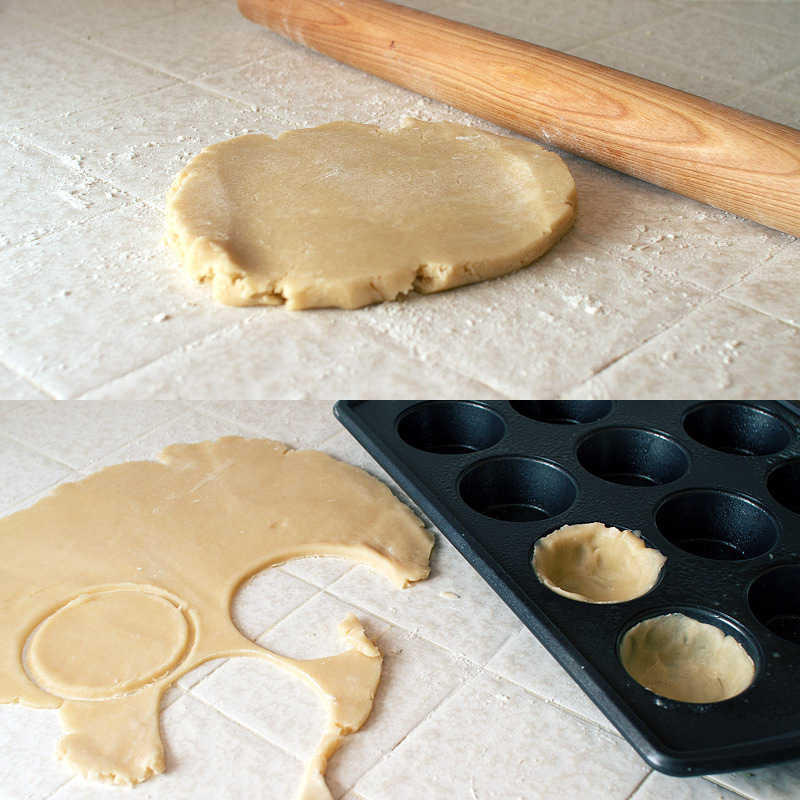 Dip a biscuit cutter, bowl or glass about 3 1/2 – 4″ in diameter into flour and cut out 6 circles. Gather the scraps, cover in plastic wrap and return them to the fridge. Repeat with second disc of dough. You should have 12 dough rounds. 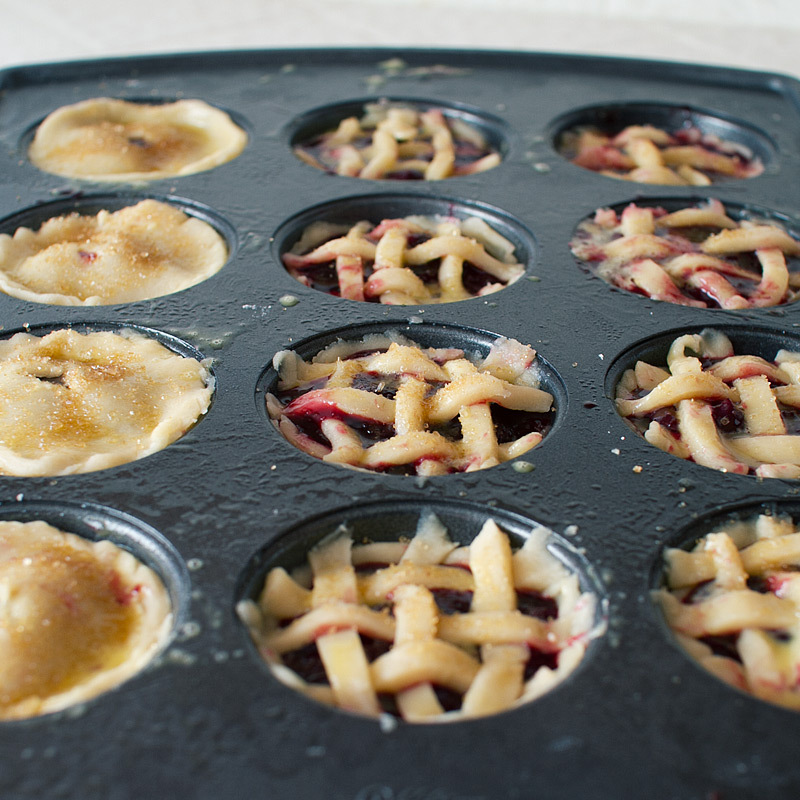 Gently fit the dough rounds into the bottom of the muffin pan and up the sides. Place in the fridge while we prepare the tops. 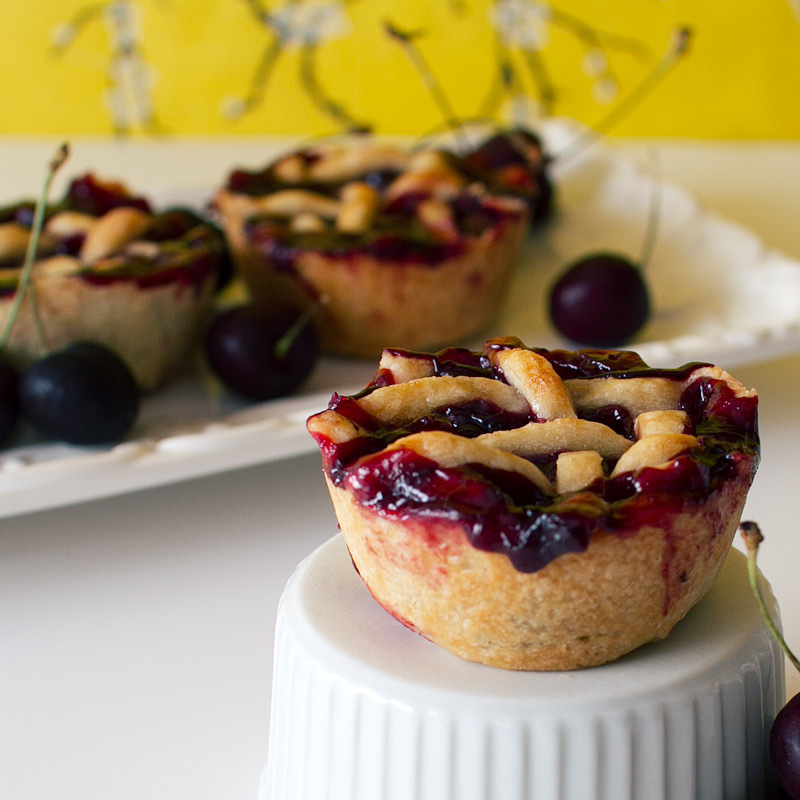 Choose Your Own Cherry Pie Top Adventure Time! 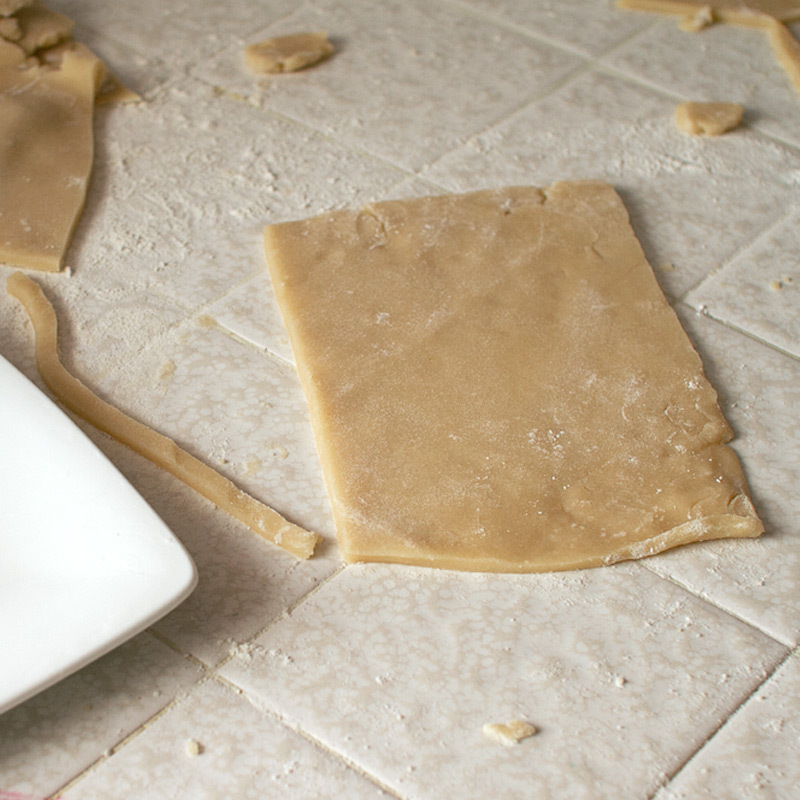 For lattice: Roll the dough out to about 1/8″ thick. Cut thin strips, about 1/8-1/4″ wide. 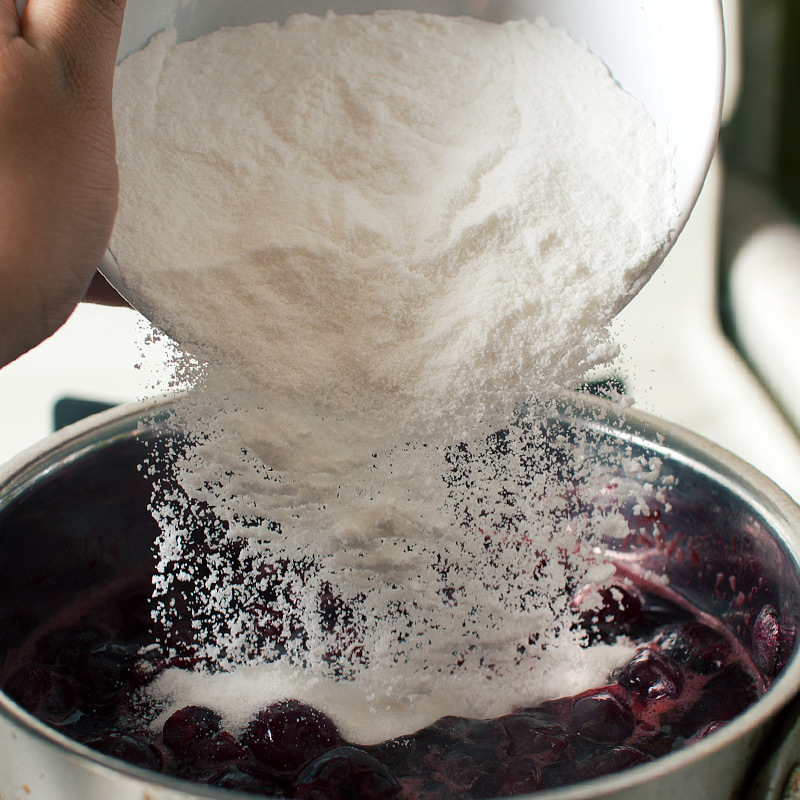 The dough may get soft, depending on how warm your kitchen is. Refrigerate as needed during this process. Follow the instructions here on how to form lattice strips. 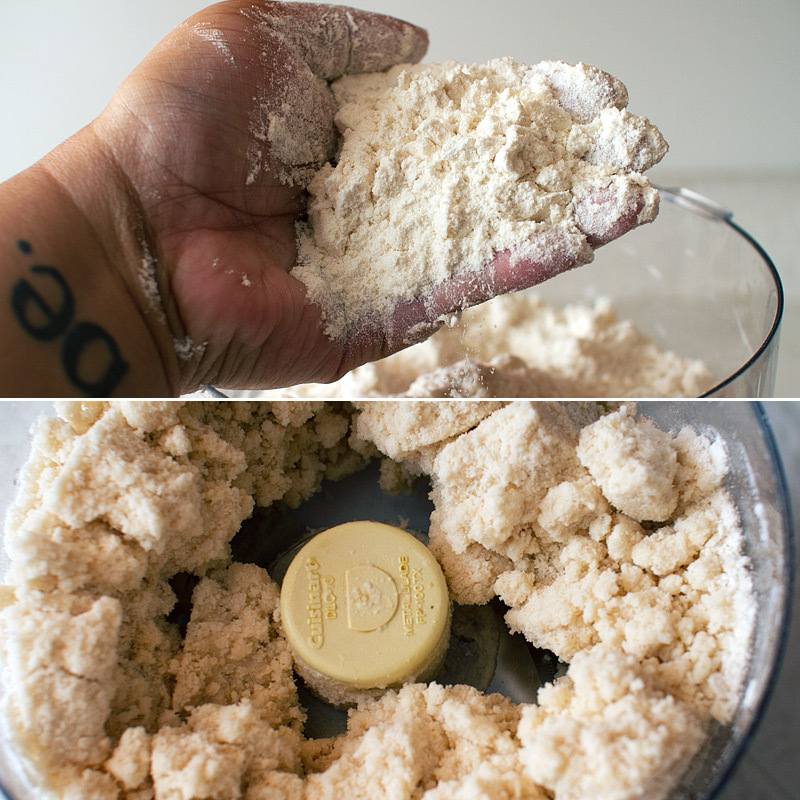 For full top crust: Roll out the dough to about 1/8″ thick. Cut out 3″ circles. Cut two small slits (or get creative and cut out small shapes!) in the center of each dough round. 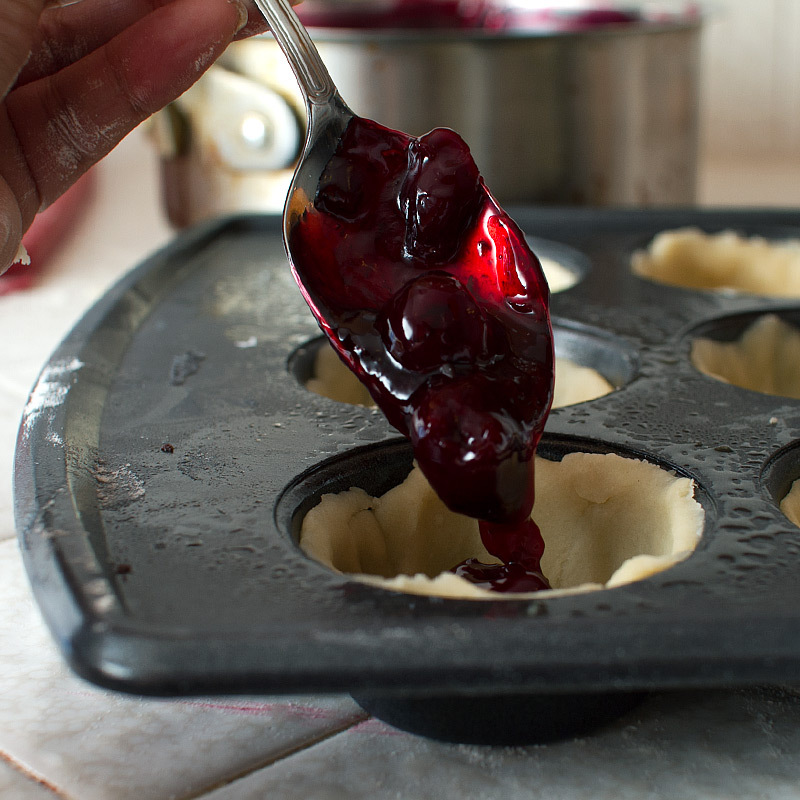 Add in about 1 1/2-2 tablespoons of cooled pie filling to each dough-lined cup, enough to almost come to the top. 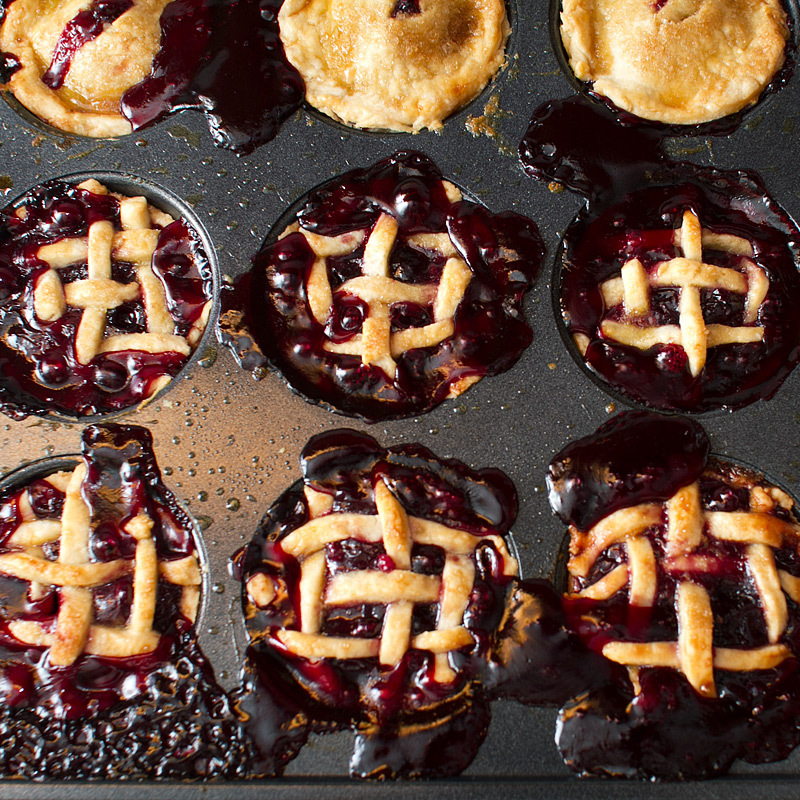 Top with either lattice dough or dough round. Crimp the edges of the top crust to the bottom crust. 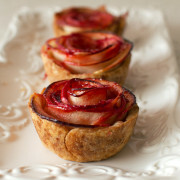 Brush the tops with egg wash and sprinkle with coarse sugar. Bake at 375F for 30 minutes, until golden brown on top. Let cool for 10 minutes in the muffin tin before removing. If you’ve greased your pan well, they should pop right out! 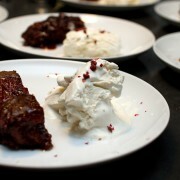 We should collabo – next time you come up with a delicious fruity cocktail, I’ll base a dessert off of it! Your lattice work looks great! 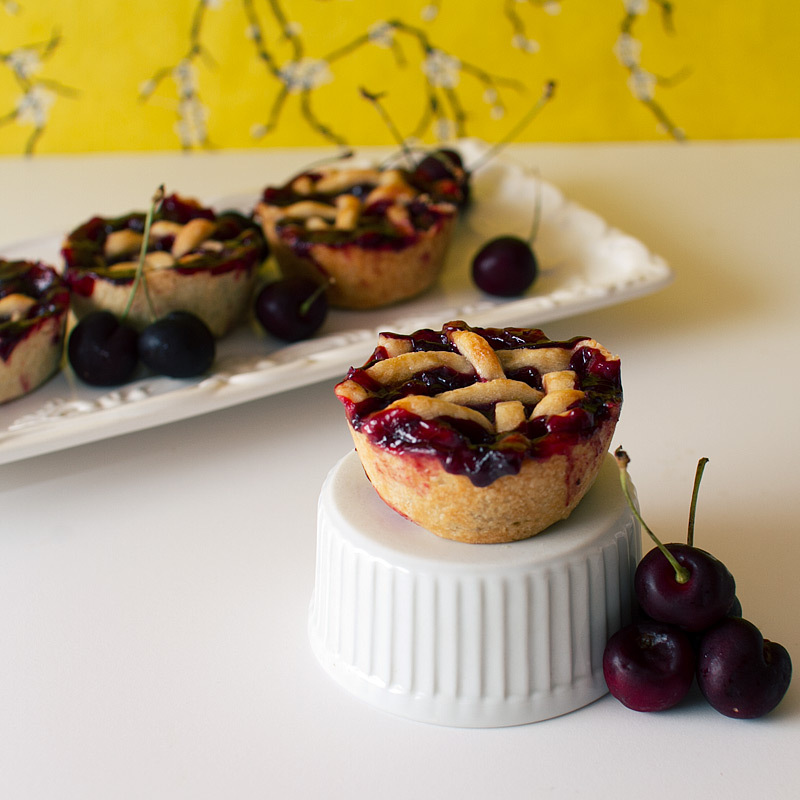 Still have not worked up the courage to pit that many cherries, the most I’ve done is 15 cherries for a clafoutis and then called it quits haha.